Plain Kate was thinking of witches. How in bad times people were more eager to buy her objarka, but more inclined to take a step back, to crook their fingers at her when they thought she wasn’t looking, or when they were sure she was. How they wanted the witchcraft to protect them, but how they looked too for a witch to blame. It didn’t matter that there was no magic in her blade, people saw it there. They saw witchcraft in her skill, witch marks in her mismatched eyes, her bad luck, her long shadow. 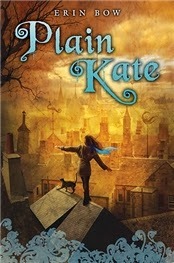 Erin Bow’s Plain Kate (published as Wood Angel in the UK, with an inexplicable cover that completely misrepresents the book’s mood and tone) tells the story of a wood-carver, Kate, who after her father’s death must learn to live by her wits, and also to protect herself from her village’s superstition. Plain Kate’s skill with a carving knife attracts suspicion, as do her mismatched eyes — and really anything that might set someone apart. Kate is well aware that at a time of hunger and devastating illness, the village is looking for someone to blame, and as an orphan girl with no wealth or influence she’s a prime candidate. Plain Kate’s precarious life changes when one day a strange man arrives by boat. He takes advantage of the villagers’ suspicion and of Kate’s isolation to get her to agree to swap her shadow for her heart’s desire, and this magical bargain has greater consequences than Kate could have imagined. To escape the voices whispering “witch”, she and her cat Taggle set off with a group of Roamers — but what begins as a journey towards safety becomes a quest to stop something terrible from happening. Plain Kate was a complete surprise. I brought it home from the library based on the strength of Meg Rosoff’s blurb (“...full of poetry, magic, humour, sorrow and joy. A wonderful book.”), plus on all the good things I heard about Bow’s second novel Sorrow’s Knot last year. But even then, I didn’t really expect to fall for this novel like I did. I have to say I have absolutely no idea how it wasn’t even on my radar up until now, because it’s so completely my sort of thing it’s ridiculous. It reminded me slightly of Chime and Gifts, two books I loved wholeheartedly; and plus I have two words for you, my friends: TALKING CAT. A lovely, sarcastic, self-interested but still affectionate talking cat named Taggle, who introduces moments of warmth and humour in an otherwise dark novel, and whose relationship with Kate I adored. I have no idea why I didn’t read this ages ago, but hey, better late than never, right? There’s something about Erin Bow’s writing that gives Plain Kate an emotional weight it might not have had otherwise. This isn’t to say the plot isn’t interesting in its own right; only that what makes it so extraordinarily good is the fact that it’s told in a way that gives it added resonance. Bow’s narrative voice is wonderful, and the result is an engrossing subtle and moving novel, full of shades of grey and of memorable small moments. Plain Kate is the story of a girl’s search for a place where she can belong, and it’s also an examination of all the small things that can go wrong and push someone who’s already on the fringes of society towards complete despair. It’s about exclusion, injustice, grief, and what people do when they believe they have nothing to lose. It’s about how someone might lose their compassion; and about the far-reaching consequences of the hurts we inflict one another. Most of all, it’s about the dangers of hanging on to the desperate belief that bad luck won’t come your way because it only afflicts those who deserve it, of turning on anyone tainted by misfortune, and of one day realising you’ve nevertheless joined their ranks. The world of Plain Kate is vaguely medieval and influenced by Russian folklore. It’s a world where Rusalkas move among the mist, where magic is real but not infallible, where hunger and disease are feared, where witches are burned, where the Roamers Kate joins are regarded with suspicion, and where menstruating women are thought of as impure. It’s a world whose power structure mirrors our own’s, but what I said recently about The Goblin Emperor also goes here: you can see the fissures. You can see the consequences of a social structure that encourages every vulnerable group to find someone even more vulnerable than themselves to scapegoat. The poor townspeople who suffer from hunger and illness accuse those who are defenceless of witchcraft in a desperate attempt to save themselves, and often turn on the Roamers when they set camp nearby. Yet among the Roamers, women are in precarious positions, and a stranger like Kate is a hair’s breadth away from becoming an outcast. And thus the cycle of exclusion perpetuates itself. In this sense, the strange man who takes Kate’s shadow, Linay, is a fascinating character. At one point I feared that Plain Kate would veer towards romance with someone who’s essentially an abductor, but it doesn’t. Instead, it complicates Linay just enough to make him interesting, and it keeps the focus firmly on the destructive cycle he’s become a part of. Also, I loved that the emotional tie at the centre of Plain Kate is between two girls: Kate and Drina, the girl she begins to think of as her sister. What ensures that Kate won’t become another Linay is the fact that she’s not alone. She finds support and companionship: she has Drina and Taggle. And on that note, prepare yourself for an ending that’s heartbreaking but not in the way you might expect (you wouldn’t be wrong to guess that I kind of have a thing for those). This is a novel where difficult decisions come with a real cost, and where there’s no shying away from the moment when it has to be paid. i remember this book being quite well loved when it first came out, but I still haven't read it despite it being on my sort of maybe list, lol. So glad you enjoyed! Sounds like from the things you say I might enjoy it. Beautiful review, Ana! I haven't heard of Erin Bow before and so this is a new discovery for me. I am normally not a big fan of titles of books being changed in different editions and I find that British publishers typically get it wrong when they change titles. But in this case I like the title 'Wood Angel' more. But from your description, it looks like they got the cover wrong :) Which title did you like more? I liked very much what you said about the cycle of exclusion. It is sad what happens in every community, whether the community is doing well - economically and with respect to social status - or not, the cycle of exclusion always seems to be there. I love the fact that 'Plain Kate' is influenced by Russian folklore. And the talking Cat - isn't that wonderful? I love talking cats (especially the chess playing cat in 'The Master and Margarita') and I want to read this book for that alone. Thanks for this beautiful review. I can't wait to read this book. You had me at the comparison to Chime! I've actually had Plain Kate on my list for a while, but I worried slightly that it would be too precious -- the talking cat thing made me nervous! But it sounds the opposite of precious. I don't remember even hearing of this book before, but I'm glad you changed that because it really does sound awesome! I read this a time ago, and then Ambrose (my middle son) read it just recently - when I read it, I don't think I knew if I liked it. Over time it has gnawed its way inside of me in strange ways. I, too, was glad that it didn't topple into the 'Hot, Dark, Mysterious Guy is the solution to your alienation and misery.' IT is hard to find books that really manage to tell a story about friendship that is as complex and fraught and important as romance ends up being in most books, and I loved that. This has been on my list for a long time...you're giving me incentive to move it up!